London-listed Randgold Resources and Canada’s Barrick have agreed to merge in a deal worth more than $18bn (£14bn) that the companies say will create the world’s largest gold miner. Randgold currently operates five gold mines in Africa, while Barrick runs mines in the US, Peru, Chile and Argentina. Under the terms of the deal, the combined group will be known as the New Barrick Group. Barrick and Randgold said the merger would create “an industry-leading gold company”, with the greatest concentration of tier one gold assets in the market. Based on both firms’ share prices at the close of trading last on 21 September, the new company would have a market capitalisation of $18.3bn. Mark Bristow, chief executive officer of Randgold, said: “Our industry has been criticised for its short-term focus, undisciplined growth and poor returns on invested capital. “The merged company will be very different. 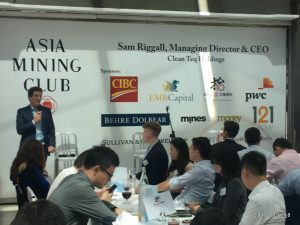 Its goal will be to deliver sector leading returns, and in order to achieve this, we will need to take a very critical view of our asset base and how we run our business, and be prepared to make tough decisions. 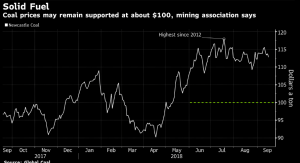 John L. Thornton, executive chairman of Barrick, said the combination of the two groups would “create a new champion for value creation in the gold mining industry”. Coal exports from Indonesia will be restrained this year, which could frustrate a plan by the government to ease a burgeoning trade deficit while keeping prices elevated, according to an industry group. Producers in the world’s largest shipper face an order backlog of 18 months as they aren’t able to get hold of additional mining equipment, Pandu Sjahrir, chairman of the Indonesian Coal Mining Association, said in an interview in Jakarta. The slow rampup in supply will probably keep coal prices buttressed at about $100 a metric ton through the end of next year, he said. 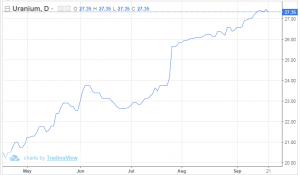 After targeting Chinese shipments of rare earths last month, the Trump administration has had a change of heart when it comes to the metals critical in permanent magnets and technological applications. In a 194-page tariff list released on Monday (September 17), there is no mention of the rare earths neodymium (Nd) and praseodymium (Pr), both used in the strongest permanent magnets, as well as the electric vehicle sector. Analysts speculate that the metals were left off the list because China is the largest global producer of the increasingly in-demand elements. According to the US Geological Survey, China produced 105,000 tonnes of rare earths in both 2016 and 2017, while the US produced no domestic rare earths. China supplies the majority of America’s rare earth materials. Last year alone, the US imported 78 percent of the rare earths it used domestically from the Asian nation. The US Geological Survey also notes that America had planned to import some 416 tonnes of various rare earths in 2018, a factor that may have informed the decision to remove the critical metals from the extensive tariff list. Aside from Nd and Pr, other rare earths are used in a variety of US industries, including jet engine manufacturing, smart phones and even oil and gas drilling. The elements used in these applications were also targeted by the US government in May, when they were deemed a threat to national security, but they have since been removed from the list as well. There is speculation that China may use the advantageous announcement to leverage its position against US$200 billion in tariffs from the US. However, that may be unlikely since just last month China backed down on tariffs targeting American oil, according to Bloomberg. 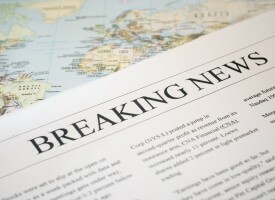 These latest reversals by both nations could bode well for diplomatic relations that have been tense in recent months. 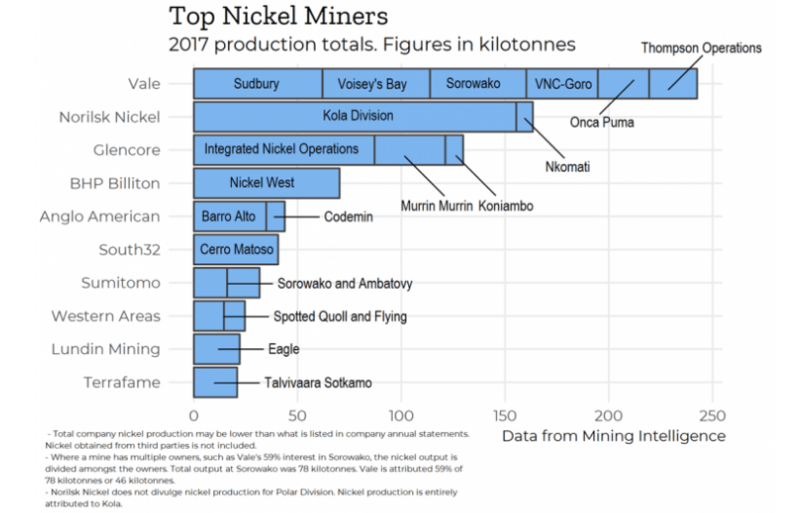 Vale is the nickel king based on 2017 production totals. Vale produced 242 kilotonnes of nickel in 2017. Norilsk Nickel was second having produced 163 kilotonnes. Note, this is nickel just derived from mines. Total excludes nickel provided by external parties. Nickel, a key metal for lithium-ion batteries and part of the electrification drive, was on a tear for most of 2018 but has recently fallen to earth. 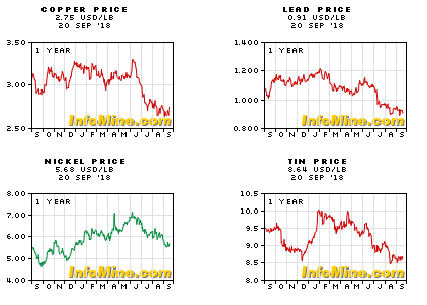 Nickel was up 25 percent this spring when it was trading above $15,000 per tonne, but it has recently succumbed to the base metal rout and is now down to $12,400 per tonne on the LME. 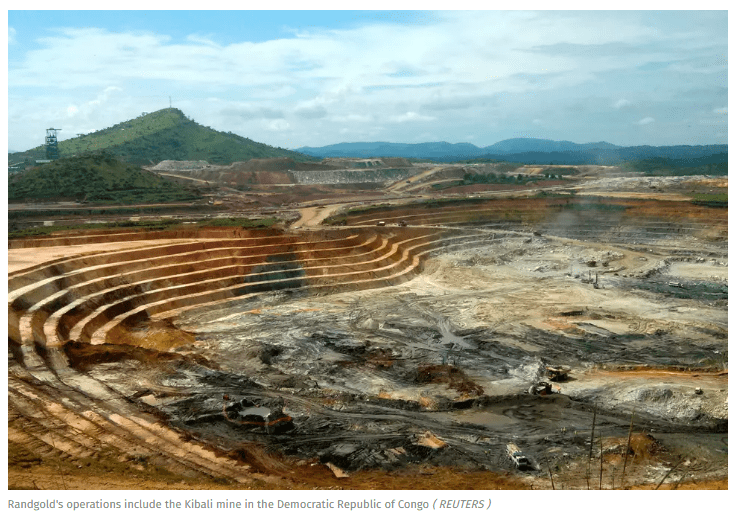 The Democratic Republic of Congo expects to issue a decree identifying strategic metals by the end of October, a government official said. Congo’s government has said it’s preparing to categorize cobalt and other metals as strategic, imposing a 10 percent royalty tax on producers including Glencore Plc and China Molybdenum Co. The measure, introduced as part of this year’s overhaul of mining laws, will add to other steps being taken by the government to boost revenue from its natural resources. WASHINGTON (Reuters) – The U.S. Treasury said on Friday it had extended until Nov. 12 a deadline for investors to divest holdings of debt, equity and other assets in sanctioned Russian companies EN+ (ENPLq.L) and Rusal (0486.HK). A deadline of Oct. 23 remained in force for divesting holdings of Gaz Group (GAZA.MM), the Treasury said. MOSCOW, Sept 17 (Reuters) – Baikal Mining Company, operator of Russia’s biggest untapped copper deposit Udokan, plans to raise $1.25 billion in project financing from a Russian bank by the start of 2019, its chairman, Valery Kazikayev told Reuters. Spurred by high global appetite for cooper, which many expect to be in demand for use in electric vehicles, the company in September started preparing the site for construction of a massive plant at the deposit, which has remained in limbo in Siberia for almost 70 years. With total resources of 26.7 million tonnes of copper, Udokan is one of the biggest untapped deposits in the world. However, it remained virgin since its discovery in 1949 due to lack of technology for its unique and difficult ore. When Kazikayev was receiving a PhD in Economics from the Moscow Mining Institute in 1976, one of the ideas being researched by his fellow students was a “clean” nuclear blast but that remained on paper. It took 10 years for Baikal Mining Company, owned by Russian billionaire Alisher Usmanov, to solve the difficult parts of the project. Usmanov bought the right to develop Udokan for $500 million from the Russian government right before the 2008 financial crisis. An additional $330 million was spent on creation of a new geological model for the deposit as it turned out that the Soviet estimate did not correspond with the real content of copper in Udokan’s ore, Kazikayev said in a rare interview. A mix of flotation and hydrometallurgy was chosen as production technology for the project, mainly focused on Chinese and other Asian markets. 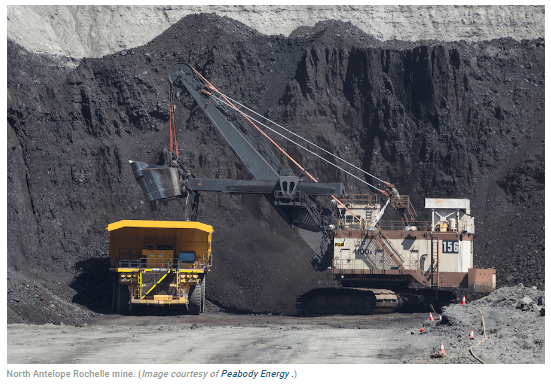 US coal producer Peabody Energy (NYSE: BTU), the world’s largest privately owned producer of the fossil fuel, said Friday it had agreed to buy Shoal Creek metallurgical coal mine in central Alabama from Drummond Co. for $400 million. Located on the Black Warrior river, the mine serves the Asian and European steel mills with high-vol A coking coal. The transaction involves the purchase of the mine, preparation plant and supporting assets, excluding legacy liabilities other than reclamation. The buying price is subject to working capital adjustments and regulatory approvals, but the deal is expected to close by the end of 2018, the company said. Deal involves the purchase of Shoal Creek metallurgical coal mine, preparation plant and supporting assets, excluding legacy liabilities other than reclamation. Ivanhoe Mines Ltd. (TSX: IVN; OTCQX: IVPAF) has completed previously announced $723 million or US $556 million strategic investment by CITIC Metal Africa Investments Limited, a direct subsidiary of CITIC Metal Co., Ltd., a subsidiary of CITIC Limited (SEHK: 267) and one of China’s leading international resources companies. Ivanhoe Mines has issued 196,602,037 common shares to CITIC Metal Africa through a private placement at a price of C$3.68 per share. CITIC Metal Africa now has become Ivanhoe Mines’ largest single shareholder through its acquired ownership of approximately 19.5% of the company’s issued and outstanding common shares. Zijin Mining Group Co., Ltd. (SEHK: 2899), Ivanhoe’s joint-venture partner at the Kamoa-Kakula Project, has exercised its anti-dilution rights, subscribing Ivanhoe shares for $78 million or US $60 million. Zijin will retain a 9.7% ownership stake in Ivanhoe Mines – its level of ownership prior to the completion of CITIC Metal Africa’s strategic investment. Following the completion of the financing, Robert Friedland, Executive Co-Chairman of Ivanhoe Mines, becomes second largest shareholders, directly and indirectly, throughNewstar Advantage Ltd., with an ownership stake of approximately 17%. Friedland and CITIC Metal have entered into reciprocal standstill agreements that prevent either of them from increasing their ownership stake in Ivanhoe Mines to more than 19.9% until January 8, 2022. 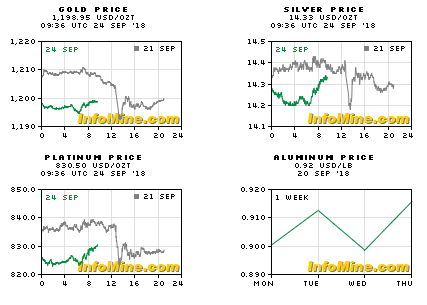 In addition, CITIC Metal and Friedland have entered into a reciprocal disposition and tag-along agreement by which each has agreed not to dispose of any common shares until January 8, 2022 without first offering the other party the right to find a buyer for the shares, except pursuant to Ivanhoe Mines’ board-of-director-approved take-overs or arrangements, non-pre-arranged transfers over the Toronto Stock Exchange, and other limited exceptions. 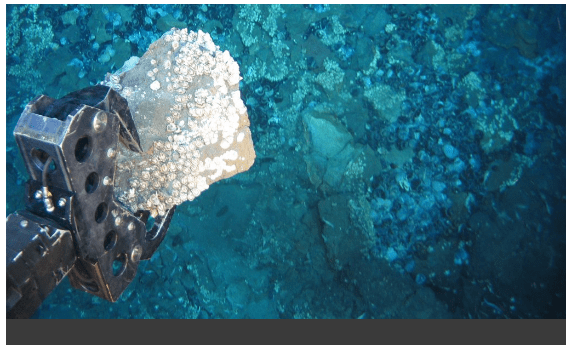 BERGEN, Norway (Reuters) – From the safety of their research vessel, scientists are exploring one of Earth’s last frontiers – the sea floor – to discover more about valuable minerals vital in the manufacture of smartphones. The scientists, from the University of Bergen in Norway, are sending robots 2,500 meters (8,000 feet) down into the waters between Norway and Greenland, to try to understand the environments potentially rich with rare earth minerals. 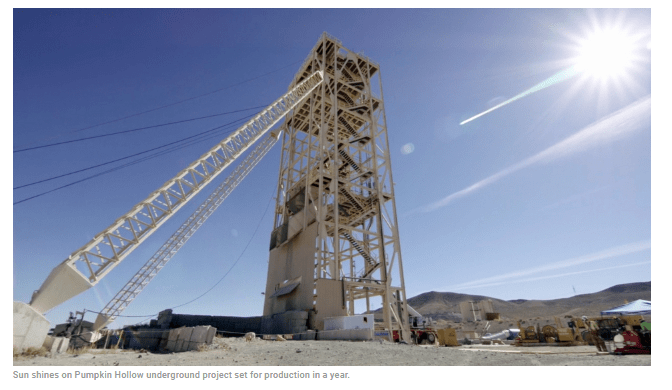 Pumpkin Hollow goes into production next year, but the underground mine is only the first phase of a planned Nevada copper operation four times the size. For Yerington it’s been 40 years in the making. The waste dumps left behind by Anaconda after shutting copper operations in 1978 still loom large over the small town in Nevada’s Mason Valley, not far from Lake Tahoe and California state lines. There have been a few false dawns and dashed hopes of a revival during the interceding decades in this region of the Silver State where mining dates back to the late 1800s. But next year the town of little over 3,000 souls – who are proud of the fact that it’s the only place in the world called Yerington – will see the opening of a new mine which within short five years could eclipse the heydays in both size and scope. Nevada Copper’s Pumpkin Hollow project sits 13km down a road lined by farms (row upon row of irrigated onions planted with what looks like down-to-the-centimetre precision) which sustained Lyon County during the lean years. The deposit was first discovered by US Steel in 1960 and if this was 2011, Pumpkin Hollow may well have been a magnetite mine. Toronto-listed Nevada Copper acquired the property in 2005 and after extensive study and drilling in the ensuing years came close, but never quite made the decision to build a mine, to the chagrin of the locals. So what’s different this time around?